Randy Drewyor, treasurer of the Bright Local Schools, speaks at a press conference prior to a Public Utilities Commission of Ohio hearing on two massive solar projects proposed for Highland County. Local and area officials gathered in Columbus on Tuesday to urge the Public Utilities Commission of Ohio to approve the construction of two massive solar farms in Highland County that could potentially bring thousands of jobs and millions of dollars to the area. As previously reported, AEP Ohio filed a proposal with PUCO in September to support the development of the facilities, which are expected to generate $6.7 million in local tax revenue and save customers approximately $200 million over the next 20 years. Additionally, the projects are expected to create 4,000 jobs during the construction process and 150 sustainable manufacturing jobs, according to Alan Stockmeister, a trustee of the Foundation for Appalachian Ohio. Stockmeister and other officials, including Randy Drewyor of Bright Local Schools, held a press conference prior to PUCO’s first public hearing on the projects to discuss their implications. 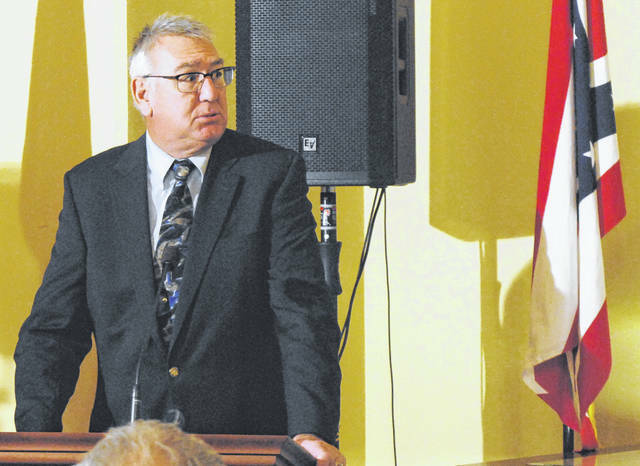 Evan Blumer, project director for the Appalachian Ohio Solar Jobs Network, said Bright Local Schools and Lynchburg-Clay Local School District will benefit financially from the solar farms, and Drewyor, the Bright Local treasurer, said the projects would “greatly benefit” his district. Drewyor said in a district where officials struggle to identify revenue sources for maintenance and improvements, economic stimulus from the solar project is much needed. As previously reported, a 3-mill property tax levy for the district was shot down by voters in the General Election last month, and prior to the vote, Drewyor and Superintendent Ted Downing said they were concerned that the anticipated income from the solar projects had some of the school district’s residents feeling the district didn’t need extra funds. At the time, Downing said district officials didn’t know when or even if the money would come in. According to AEP spokesman Scott Blake, a 300-megawatt facility developed by Hecate Energy Highland LLC will take up a whopping 2,500 acres and be located approximately three miles northwest of Mowrystown. According to the solar jobs network, the facility is the largest solar project proposed in Ohio. A 100-megawatt farm developed by Willowbrook Solar LLC will be located two miles east of Mowrystown in Concord and Whiteoak townships, Blake said. AEP Ohio previously secured two 20-year Renewable Energy Purchase Agreements for the power produced at the two facilities, according to a news release. Officials have said the projects will be completed by 2021 pending regulatory approval. Sawmiller said veterans will be given preference in the hiring process. “The commitment to create new manufacturing jobs and employ military veterans provides an exciting vision for Appalachian Ohio that we are proud to support,” said Sawmiller, who is a veteran himself. Anticipated jobs include construction, administrative and retail jobs that will develop as a result of and in support of the solar projects, as well as additional jobs created by those workers spending money in the local economy, according to the solar jobs network. In her letter, Sloat encouraged area residents to write to the public utilities commission in favor of the projects. Those interested in doing so can send mail to Public Utilities Commission of Ohio, 180 E. Broad St., Columbus, Ohio 43215, including case number 18-1392-EL-RDR. Otherwise, Sloat recommended contacting the governor’s office or state legislators to support the projects.